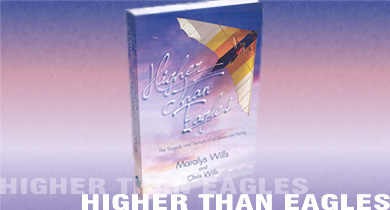 Higher Than Eagles is the story of the Wills family and in particular of oldest son Bobby, who, with his brother Chris in 1973, co-founded the hang gliding company that would become Wills Wing. It is a deeply intimate portrait, at times almost painful to read, but in the end a fascinating and compelling story. Wills Wing has released a new 8th edition of its very popular book, Paragliding – A Pilot’s Training Manual. The 8th edition includes an expanded Bonus DVD, now with a full 90 minutes of narrated video footage. Enhancements in the new 8th edition include numerous additional photos and improved illustrations, and significantly expanded content, including new material on the latest and most proven kiting techniques. Both the written manual and the accompanying DVD have been expanded and enhanced. The eighth edition is now available in two bindings, paperback or hardcover. Jenny Winfield, a 20-something fledgling features writer in Chicago has enough to keep her busy: a boyfriend Smithie, her rescue dog Laurence Olivier, and her beloved Uncle Louie, whose recent run in with loan sharks is a constant worry. A free spirit, Jenny is quirky, some would say flighty, and always late--with strong opinions and a drive to express them. Plus she's endowed with a fashion sense unique to her own. Scott McCabe, gorgeous 38-year-old airline pilot, lives his West Coast life on his own terms. Neat, punctual and no surprises. Always in control, like Scott himself, his life is predictable, ordered, and full enough to suit him. Exactly how he likes it. A black-edged telegram changes all that in an instant. The death of his oldest friend, and her half-brother, throws the two polar opposites together. They become unlikely partners in a failing hang-gliding business. Set in 1980, during the turbulent take off of the new sport, the two lovers shoulder the burden of their inherited money woes, but their opposite personalities have them questioning the intense attraction and obsessive love they both feel for each other. 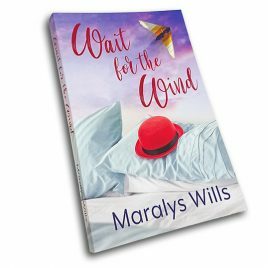 Jenny makes a rash decision to enter the two of them in a dangerous trans-pacific hang-gliding contest, hoping to win the prize money, and save the business. Scott, compelled by his desire for her, reluctantly goes along--though his history and instincts are screaming, "No!" The dangerous race could end their burgeoning relationship, and possibly their own lives. They will enter soar or surrender to the forces that may prove their undoing. 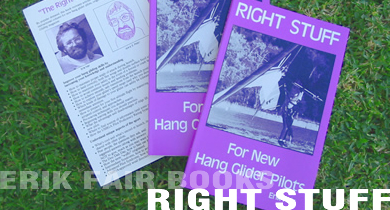 Erik Fair’s inimitable classic Right Stuff is a timeless collection of Erik’s (mostly) informative and (always) entertaining instructional columns, originally published in Hang Gliding Magazine. “Talking Downdrafts With The Pear People,” Erik’s story of a Superbowl Sunday misspent answering questions on hang gliding for wanderers-by at a shopping mall, is, all by itself, more than worth the price of admission. 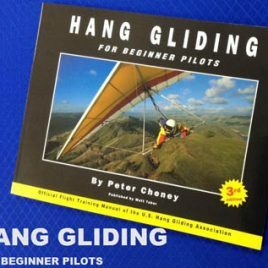 Beyond just entertainment though, there’s a wealth of useful information for advancing hang glider pilots, presented in an easily accessible style. Every pilot’s library should have one.